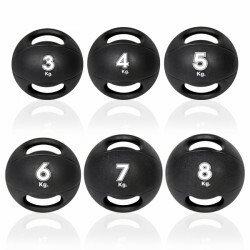 The complete set consists of four Taurus Wall Balls with the weights 3 kg, 5 kg, 7 kg, and 9 kg. Several exercises for the whole body are made possible with the Taurus Wall Ball Set (3-9 kg) by throwing, bouncing, rolling, etc.. 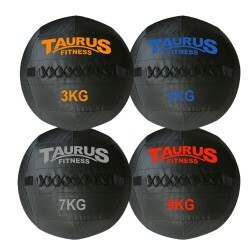 Complete set including four Taurus Wall Balls weighing 3 kg, 5 kg, 7 kg, and 9 kg. The complete set is much more affordable compared to single purchases! 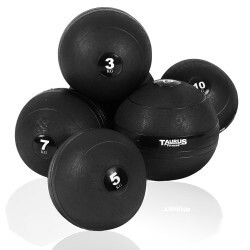 Do versatile exercises of Functional Training with the Taurus Wall Ball. 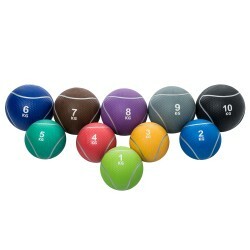 The Taurus Wall Ball has a diameter of 35 cm and its surface is made of sturdy synthetic leather. It is available in different weights. Medicine balls are classics of fitness. The variety of exercises is almost unlimited. The Taurus Medicine Ball has a non-slip surface, a very good workmanship, and is available in 10 weights. 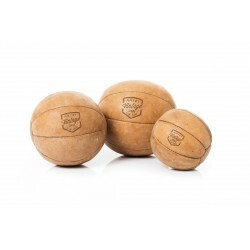 You've got both your hands full with the ARTZT Vintage Series medicine ball. The training with medicine balls requires quite a grip and offers an additional challenge for dynamic training of strength, core, and coordination. 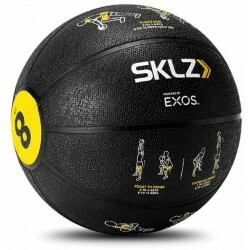 Extremely resistant slam ball for the use at gyms or for boxing: The slam ball has a surface made of PVC and resists all slam and throwing movements. The Medicine ball with grip holes 7 kg of Sport Tiedje is a combination of 2 classics: the dumbbell and the medicine ball. 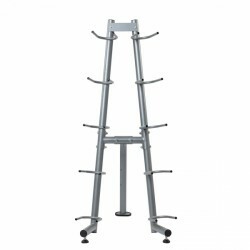 Thanks to handles on the sides, it is ideal for strength training and Functional Training as well as boxing. Do different exercises of different areas with the Taurus medicine ball. The bezeichung has a structured surface for good handling and is available in 10 weight levels. 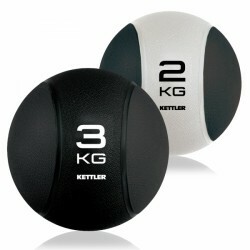 The Kettler medicine ball is optimal for varied workouts for fitness, physiotherapy or rehabilitation. The ball is massive and comfortable to hold. At the same time it is quite soft if falls on the floor. Medicine balls strengthen almost all muscles and are suitable for fitness and strength training as well as physiotherapy. IN addition, exercising with the medicine ball trains coordination and fitness. Medicine balls are available in different versions. 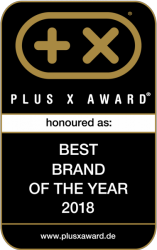 The selection includes weight categories of 1 kg to 10 kg of different colours and materials. The Taurus Double-Grip medicine ball, which is a mixture of medicine ball and dumbbell, is suitable for very intensive training sessions.